On Monday, April 28, 2003, Gapers Block made its official debut. We're 10 years old! Over the next weeks, we'll highlight some of the best of what we've posted over the past decade. Gapers Block was founded in 2003 by Andrew Huff and Naz Hamid. 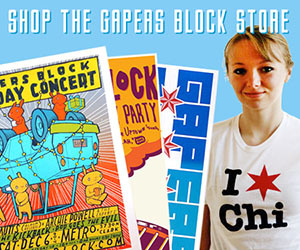 At that time, there were very few city blogs anywhere in the country, and Gapers Block was the first in Chicago. Gawker and Gothamist also launched in 2003; Chicagoist launched a year later. What do you call the slow-down in traffic that occurs when an accident or something else happens on the side of the road? Other places call it rubbernecking or a "lookie-loo"; Chicagoans call it a gapers block or gapers delay. 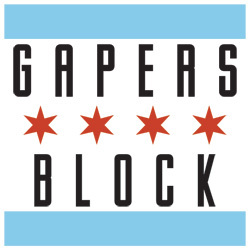 We chose Gapers Block as the name for the site because it was an "insider-y" term that only locals know, and it fit our mission is to get people to slow down and check out their city. Our intention was to create a website that provided a place for Chicagoans to find worthwhile news, interesting online projects and cool events. At the time, the city's mainstream media -- and even the alternative media -- had terrible websites. The Tribune's site required you to log in, the Reader didn't publish articles from the paper online, and let's not even talk about the Sun-Times. Meanwhile, the existing events calendars, Metromix and the Reader's listings, were a nearly unusable compendium of everything, often mixing drink specials and weekly DJ nights in with more noteworthy events. Naz and Andrew invited around 15 local bloggers whose writing they liked and who we thought might share our love for Chicago and our enthusiasm for sharing it with the world and our neighbors. Happily, about a dozen agreed. Gapers Block launched on April 25, 2003, and garnered national attention from the blogosphere. The original site included Merge, Slowdown and Rearview, which continue to appear on the front page today. In addition, Fuel asked readers a question every couple of days; Detour, a place for longer feature articles three times a week; Glovebox, a weekly sampling of things we were into at the time; and Transmission -- which at the time was a weekly mp3 from a local musical act. Transmission and Glovebox went away early on. Detour spawned a couple of regularly occurring features, such as "Ask the Librarian," which eventually turned into Airbags (archives here), our collection of first week-daily, then daily and more than daily columns. Eventually, we added the first topical sections, Transmission and Book Club (which was once an actual monthly in-person book club), followed by Drive-Thru, A/C, Tailgate and Mechanics. Airbags and Detour were both discontinued as more emphasis was placed on the topical sections; each of the last group was anchored by one of the Airbags columns. Most recently, Fuel ended when the site was redesigned in 2012. Over the years, nearly 300 people have been on official Gapers Block staff, and dozens more have contributed a story or two. The staff has always been volunteers -- bloggers, journalists, students, and people with boring day jobs (and some not so boring) looking for an outlet for their writing. (We're always open for new contributors.) Amazingly, a couple of the original writers are still with us -- Jim Allenspach, Ramsin Canon and Cinnamon Cooper. Although GB launched on April 28, we started posting the week before, so that there'd be a backlog of posts when it debuted. The first post didn't include a link, and the second noted that the Berghoff had added seats in the bar for the first time in its then-100-year existence. The first new post on the 28th highlighted a "Made in Chicago" art exhibit at the City Gallery. Stay tuned for more bits of GB history, and for details about further 10th anniversary celebrations. Thanks for reading!